There's a new kid in town in Bayport, and Frank and Joe Hardy aren't really sure what to make of Max O' Malley, the Magician. Not only is he totally annoying, he claims that he can make anything--or anyone--disappear. 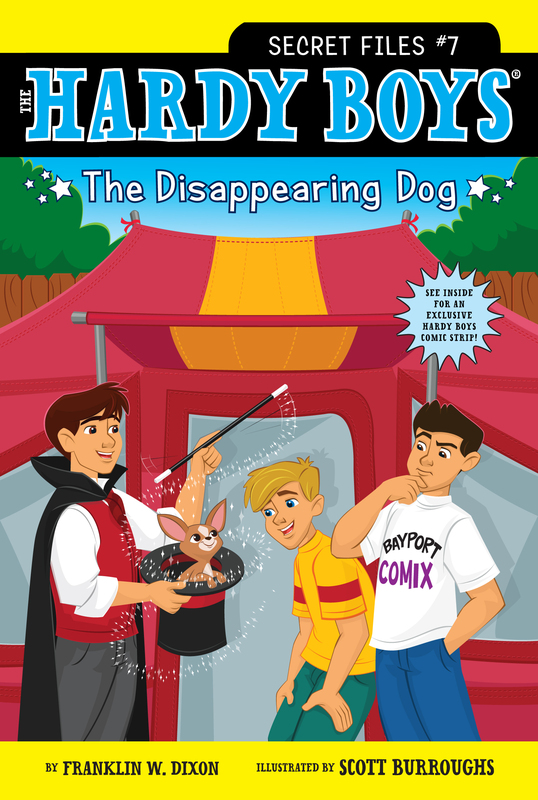 Though Max wins over a bunch of his classmates, Frank and Joe remain skeptical--until Mrs. Briar's prized show dog, Charlie, suddenly disappears--and keeps on mysteriously diappearing and reappearing. Max quickly becomes the prime suspect, but is he really the one behind the strange occurances? Or is Max really as magical as he says he is? Just then a boy appeared at the classroom door. He was dressed in a knit shirt, jeans, and sneakers. He was holding a green backpack in his left hand. Frank wondered what was so special about this average-looking kid. Max smiled at the class. “Yeah,” a few kids said sleepily. Ms. Yung nodded at Max, and he ran out of the room. Frank gave Callie a puzzled look. Before he could say anything, though, Max was back. But now he had a black top hat on his head, a black cape around his shoulders, and a long black wand in his left hand. Frank looked at Callie and rolled his eyes. Several kids at the front began to applaud weakly. Then the applause increased to the point that it was at least polite. “Oh, brother,” someone in the class mumbled. Suddenly Max took off his top hat and waved his wand over it, and a puff of smoke whooshed from inside. “You’re not supposed to light anything on fire on school grounds!” Emily Franklin shouted. This time the class clapped louder than before. And Frank had to admit that he hadn’t expected smoke to come out of Max’s hat. But he wanted to see some more tricks before he was really impressed with the class’s new member. “I know. He’s making it hard. I want to like him,” Frank replied. The geography quiz was mostly about China, Ms. Yung’s parents’ home country before they moved to the United States. Frank thought he knew all the answers. Max headed to the front of the room. He took his cape off the hook and put it around his shoulders. When he set the top hat on his head, though, there was a sound: Cheep! Cheep! Cheep! A silly grin appeared on Max’s face. He took the top hat off, stuck his hand inside it, and pulled out a baby chick. “Well, what do you know?” he said. He showed the chick to the class. There were several oohs and aahs, and then everyone applauded again. For the next several minutes Max walked around the room, pulling a quarter out from behind Ms. Yung’s ear, a dime out from behind Callie’s ear, and a penny out from behind Frank’s ear. “My ear is worth more than a penny!” Frank complained. Frank looked over at Callie. “For some reason I don’t think Max likes me,” he whispered. Just then the recess bell rang. Everyone started filing out of the classroom. Max followed Frank and Callie outside. Frank spotted Joe and some of his classmates dribbling basketballs on the outside court. Joe and his friends turned and looked at Max dressed in his magician’s outfit. Max stood under one of the baskets. Joe and his basketball buddies formed a row in front of him. They were soon joined by kids from some of the other classes. “I’ll introduce you, Max,” Frank whispered. He turned to the audience. “Ladies and gentlemen, I give you the one, the only, Max O’Malley, Magician!” He and Callie began applauding, and they were joined by the rest of the audience. Then Frank turned to Max and nodded. “The stage is all yours!” he said. Max went through his usual routine and was an immediate hit. Frank was a little miffed that Max pulled a quarter from Joe’s ear. He was sure Max did it on purpose.